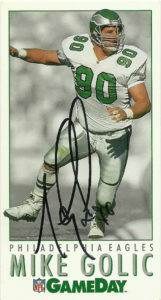 Mike Golic was prized for his size, technique, and flexibility that allowed defensive coordinators to use him at any position along the defensive line. He also comes from strong bloodlines. His father played in the CFL and his brother Bob played for the Raiders. 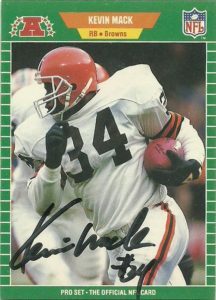 After a solid college career at Notre Dame, Big Mike was selected by the Houston Oilers in the 10th round of the 1985 draft. After sitting out his rookie year due to injury, Mike turned on the juice in 1986, starting half the slate of games for the Oilers with 66 tackles, 1 sack, and 2 forced fumbles. Surprisingly Mike found himself on the street in 1987 after 2 games and before the players’ strike. 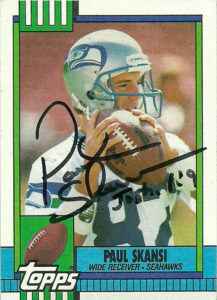 The Eagles wisely scooped him up. 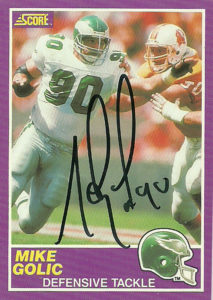 Under Buddy Ryan, Mike was part of a rotation on the line that kept him fresh off the bench. He played the next 5 years with the Eagles. 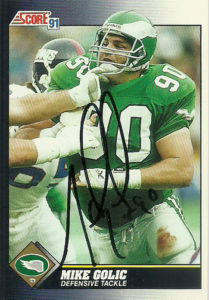 Golic’s best seasons came back to back in 1991 and 1992 when he put together 2 72 tackle seasons. 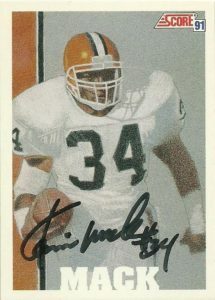 He joined the Dolphins in 1993, but did not find the same success in Miami, as Mike played injured for most of the season on a torn knee ligament. 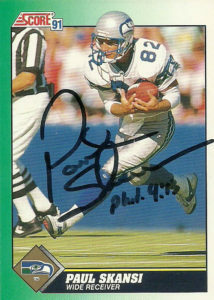 Infamously, he learned the hard way about business in the NFL when he was cut on the eve of minicamp in ’94. Mike had off season surgery, and well knowing the team had drafted 2 defensive players to beef up the line, he was out to prove that he could still motor on that healing knee. The conundrum was that in order to get out onto the field, the trainer told Mike he’d have to sign a paper indicating his knee was fine. Eventually Mike relented, and the moment he attempted to leave the trainer’s office, he was confronted by the turk, who told Golic that the GM wanted to see him. You see by signing that piece of paper, he waived his own rights. The team couldn’t cut him due to injury and owe him a salary, but since he was 100%- Mike lost some $650K by his count. Just cut throat. Well Mike was lucky. He had a fallback. It just so happened that he was quite natural on the microphone- a talent he started honing back in Philly. A long time radio and TV personality, Golic has been a staple on ESPN programming since the turn of the century. 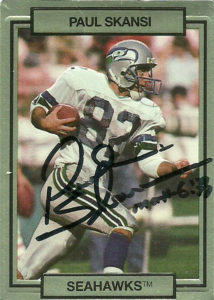 It didn’t take much time at all to get Mike’s autograph on these 4 cards which feature a pretty decent selection of photos from his playing days. Deadhorse comes through again for me. 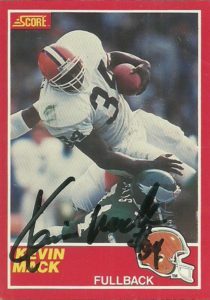 My Cleveland connection who gets a rare bone thrown to him from time to time set me up with a signing that included 3 great Browns backs: Earnest Byner, Mike Pruitt, and Kevin Mack. Kevin has a lot of great nicknames because of his indelible last name. 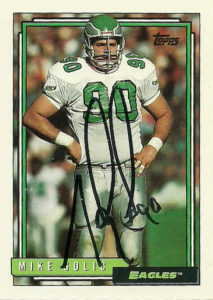 My friends and I used to call him ‘Mack Attack’ in Tecmo Bowl (circa 1987/8), but I’ve heard ‘Mack Truck’ and a few others because well, not only did he hit like a truck in Tecmo, he attacked the line in real life. Some really nice cards of Kevin here that I got signed the second time around. Each of them showcase Mack’s power and ability to lead with his massive shoulders. The ProSet 1989 is a marvelous action shot with just perfect framing, while his Score 91 is a solidly designed illustration. The Score 1989 is why Topps was caught so flat footed by both ProSet and Score’s entry into the card market. Not only did they use dynamic photography and action shots, the colors on the higher grade card just illuminated the canvas.